A South Florida brewery is being recognised by the People for the Ethical Treatment of Animals (PETA) organisation after news of its edible and biodegradable six-pack beer can ring holders went viral. The packaging is made from barley and wheat ribbon, spent grains from the brewing process. 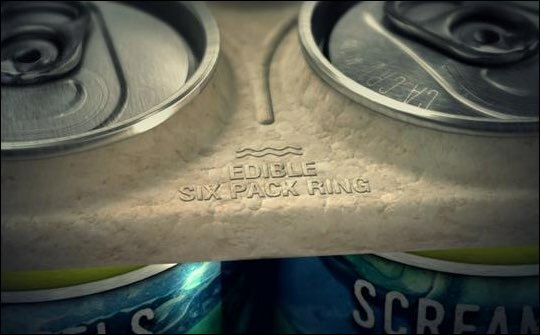 Saltwater Brewery created the edible rings – made from by-products of the beer-making process – to save wildlife that often become strangled or poisoned by plastic beer can holders. The microbrewery developed the idea in conjunction with advertising agency We Believers, using 3-D printers to create a working prototype. Five 3D print moulds were used to produce the first batch of 500 rings and the brewery plans to produce 400,000 edible ring holders every month. The packaging costs 10-15 US cents per unit. The craft beer six-pack sells for US$10. The holder is edible for fish and other sea life (turtles) as well as being biodegradable. The Compassionate Business Award from PETA honours companies, like Saltwater Brewery, that have done something innovative for animals. It is a big investment for a small business but Peter Agardy head of branding at the brewery hopes to inspire ‘the big guys’ to look at alternatives like this and help preserve the sea and environment. "Saltwater Brewery has set an example for other beverage companies with its edible six-pack rings that feed marine animals instead of choking or poisoning them," comments PETA executive vice president Tracy Reiman.